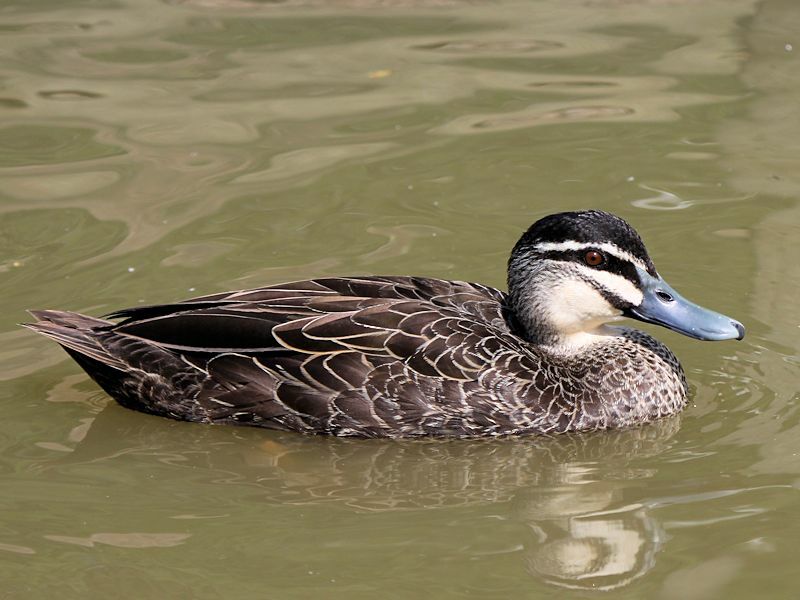 Indonesia, New Guinea, Australia, New Zealand and S.W. 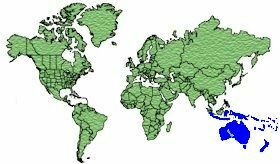 Pacific Islands. 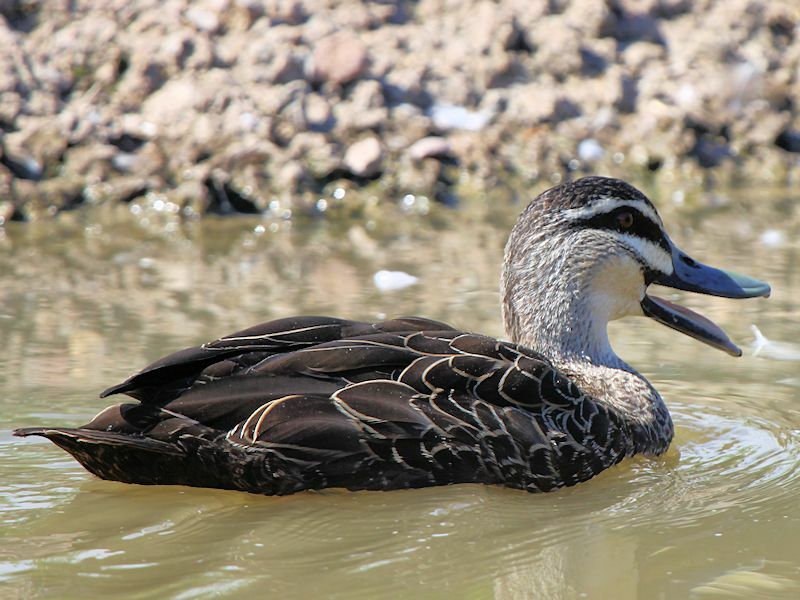 Northern Australia in the winter and southeastern Australia in spring and summer. 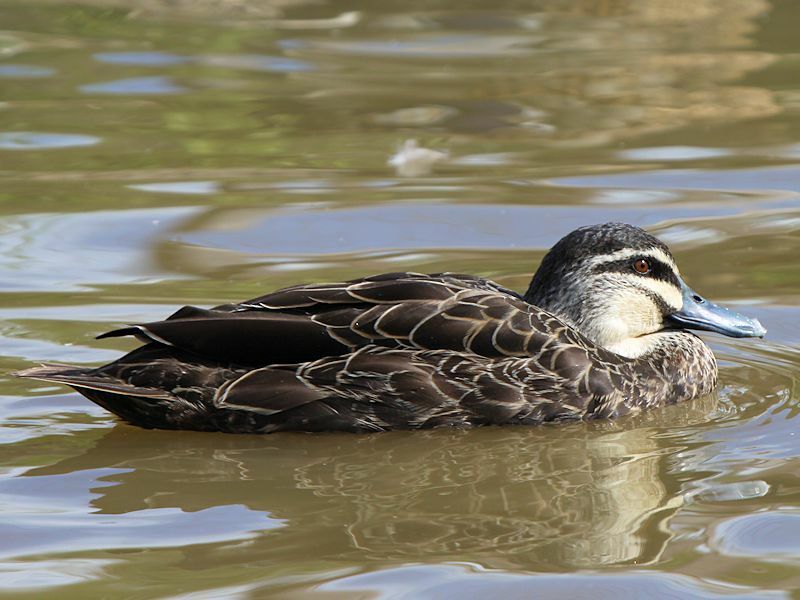 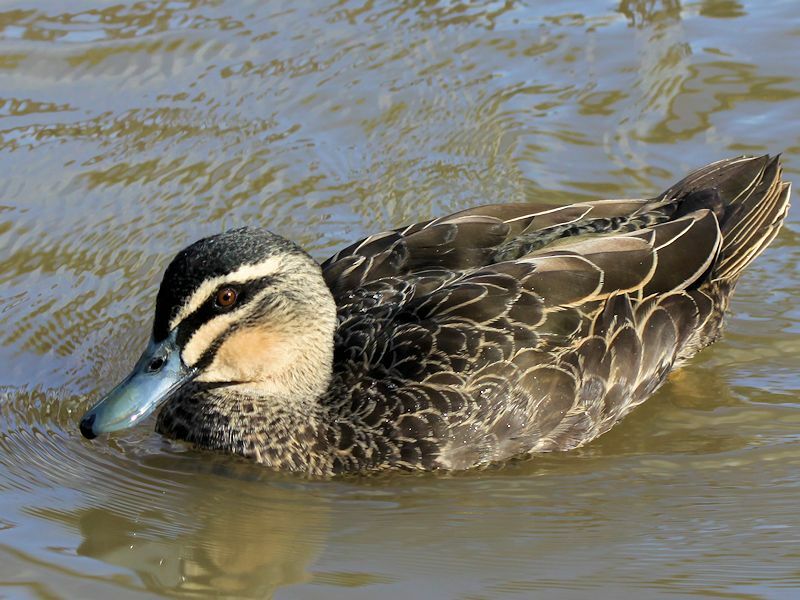 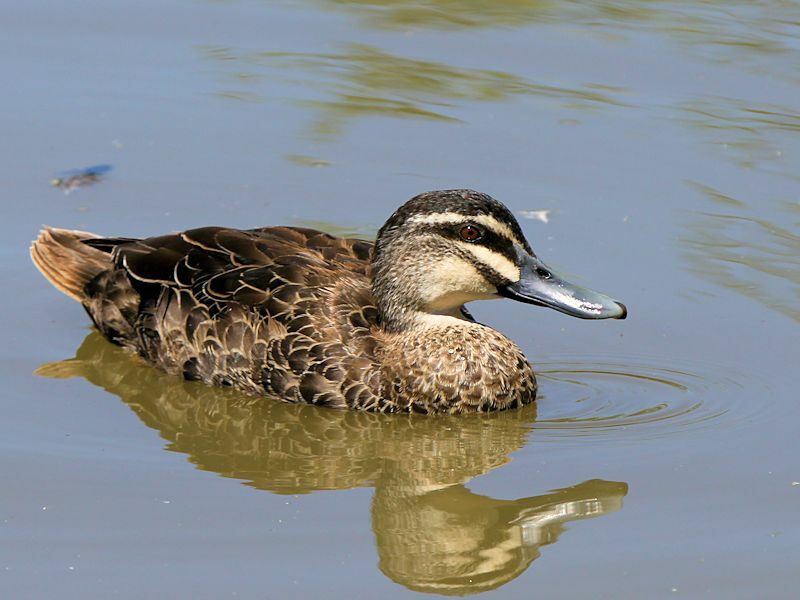 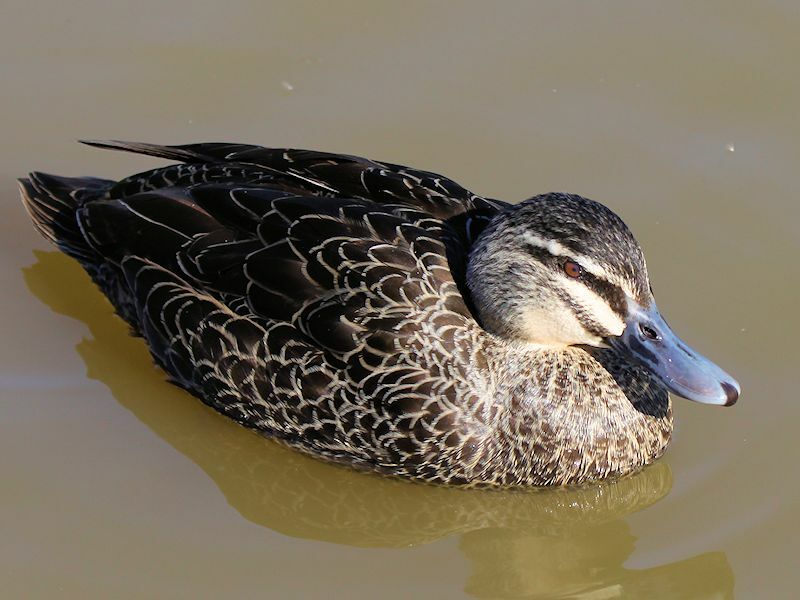 The Pacific Black Duck has a Dark crown, pale head with Black facial stripes - one broad eye-stripe and another thinner stripe from the base of the Grey bill and Brownish-Red eyes. 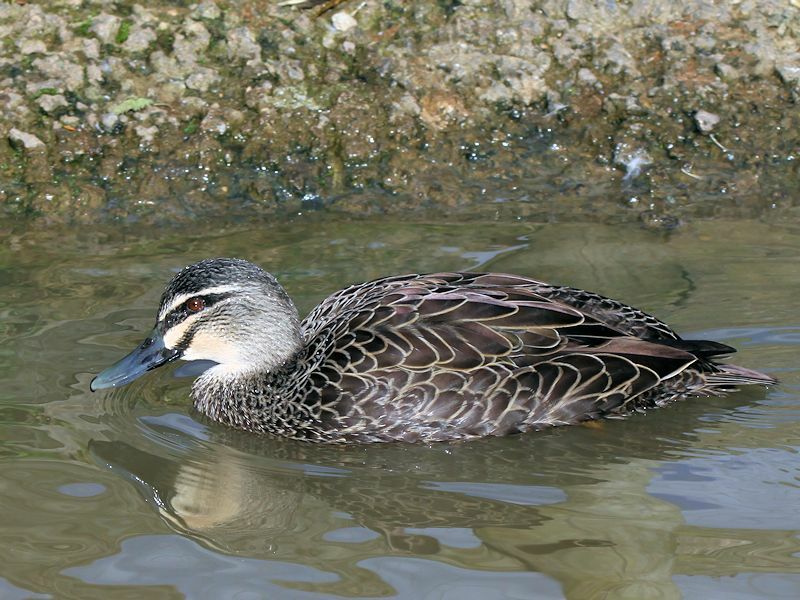 The body has Dark Brown feathers edged in Cream, flight feathers are Brown, pale underwing, Green speculum and Olive-Grey legs and feet. 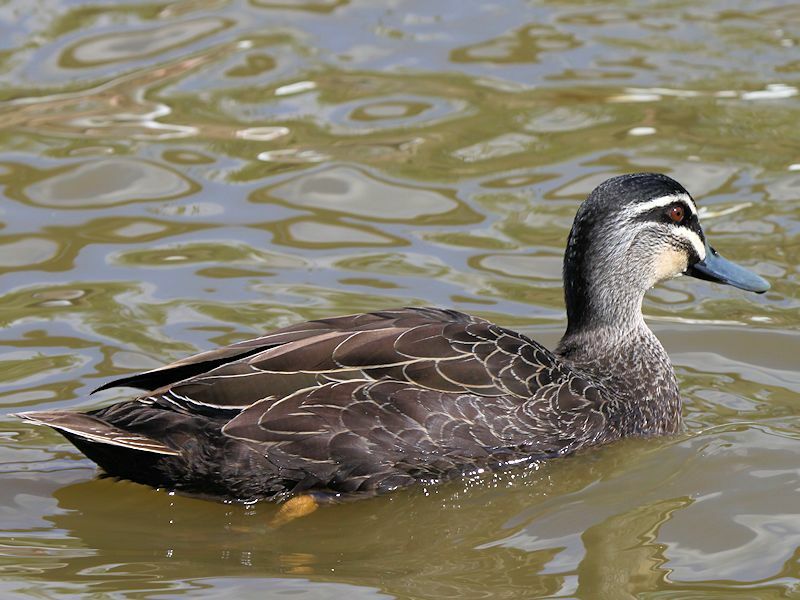 The same as the Drake but smaller. 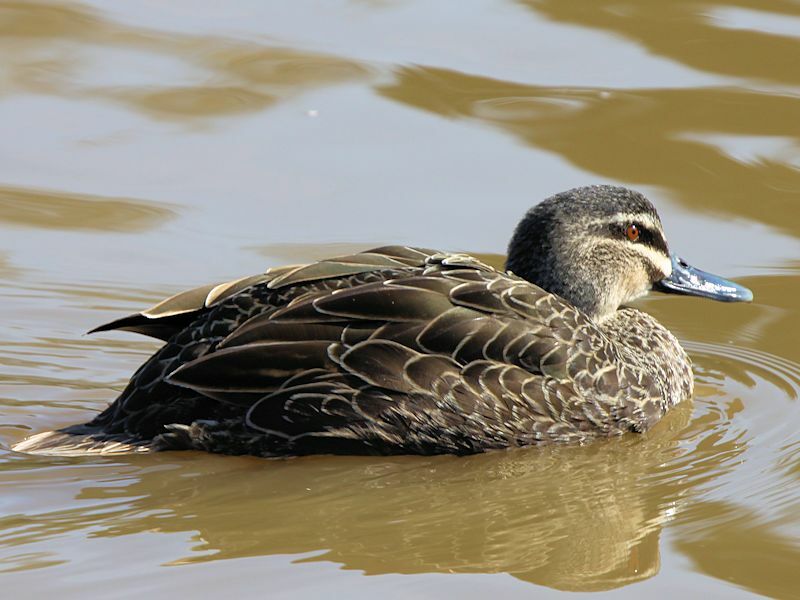 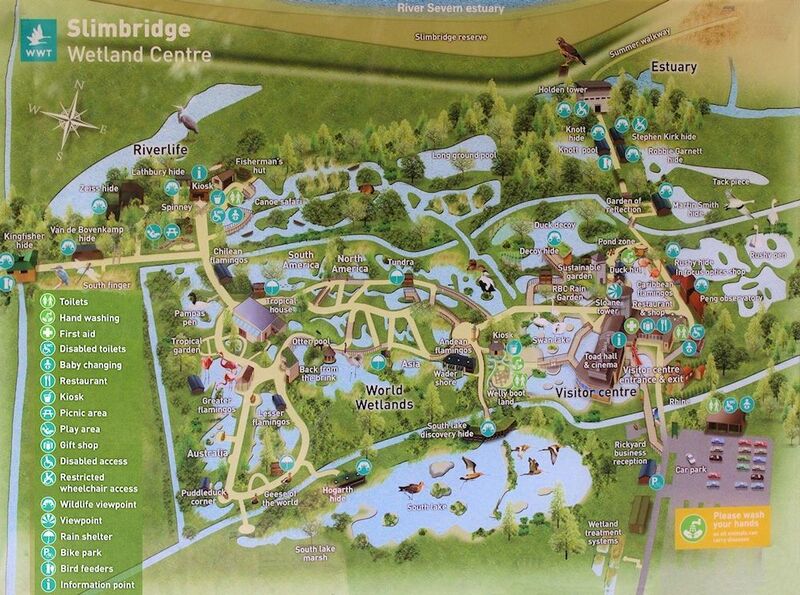 Wetlands, Lakes, Flooded Grasslands, Swamps and Lagoons. 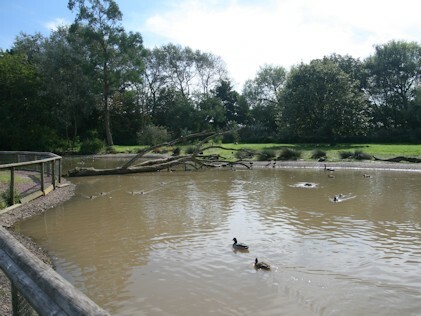 Aquatic Plants, Seeds, Roots, Crustaceans, Aquatic Insects, Molluscs and Invertebrates. 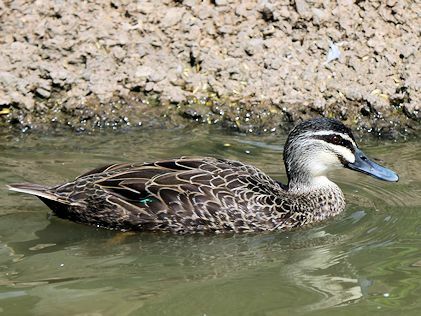 June to January in the South and January to April in the North. 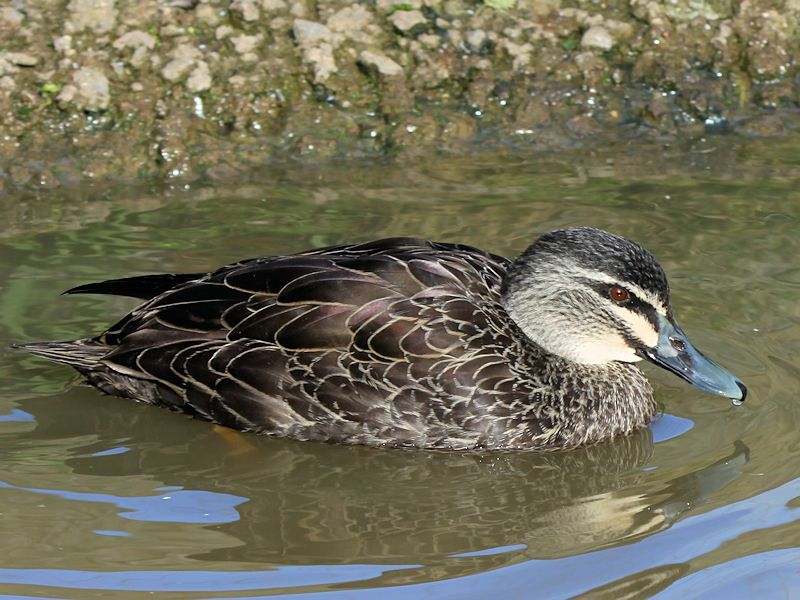 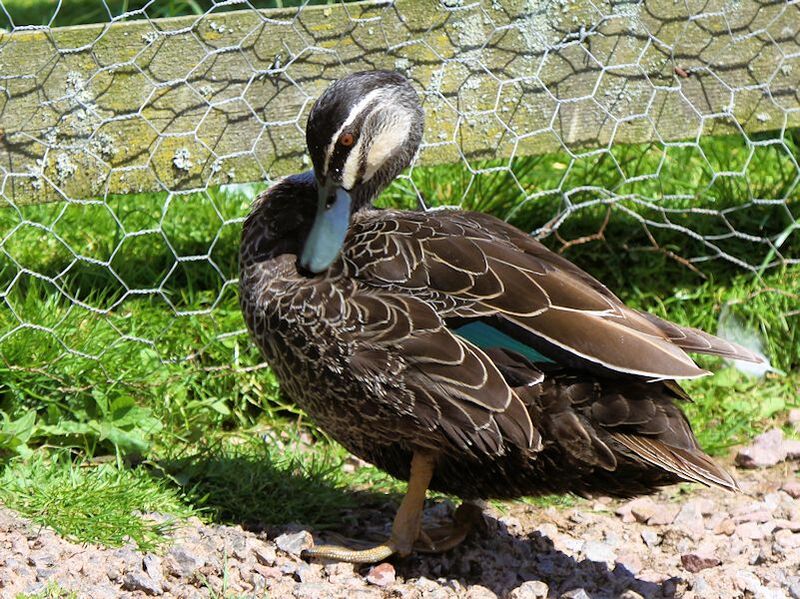 The Pacific Black Duck is a dabbling duck found in Indonesia, New Guinea, Australia, New Zealand and many islands in the southwestern Pacific. 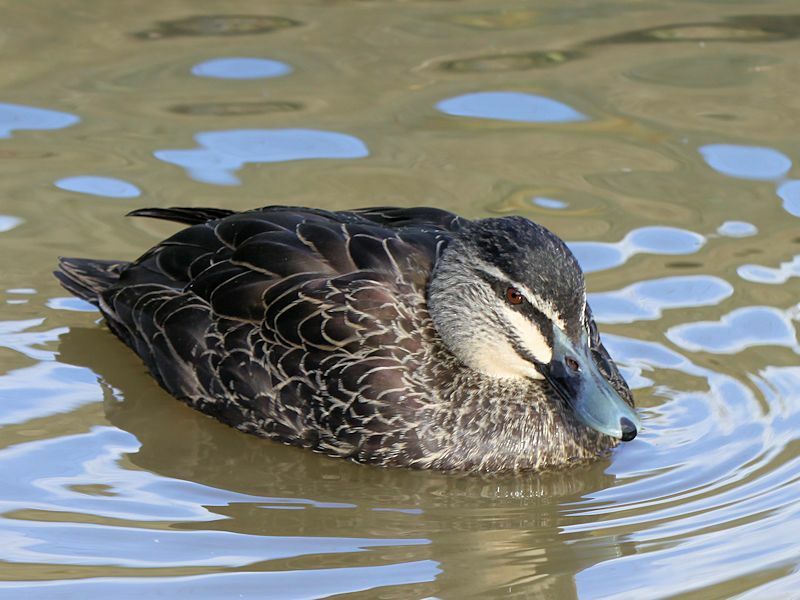 The Pacific Black Duck Numbers has decreased in New Zealand because of the introduction of the Mallard which competes for food and also due to the hybridisation of the Pacific Black Duck and the Mallard.